This is a story that I transcribed from the February 4, 2002 edition of the Enterprise Mountaineer. I do not yet have permission to republish this story, but I decided to go ahead and add it to my site in the meantime. This article gives you an idea of what was lost to our forefathers when the American chestnut blight, carried here when people brought Chinese chestnuts to North America at the turn of the 20th Century, caused one our our greatest trees to go extinct. It also tells of the hope that we may one day see the tree, or at least a genetically altered hybrid, once again in these forests. You can still see the remnants of the American Chestnut tree on the Ranch. Because of the rot resistance of the wood, if you are taking a hike and see a very large, weathered and gray stump, cut off about 2 or 3 feet above the ground, it's actually the 70 year old remains of an extinct American chestnut tree. All the other trees stumps from that era have long since rotted away. Also, not mentioned in the above article was the fact that when the American chestnut tree was wiped out, it took the number one food supply for almost all the wildlife along with it. Needless to say they have not recovered. 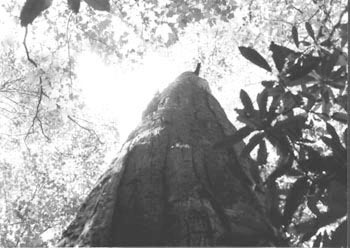 Read more about the American Chestnut what happened and it's possible future at the American Chestnut Foundation website. 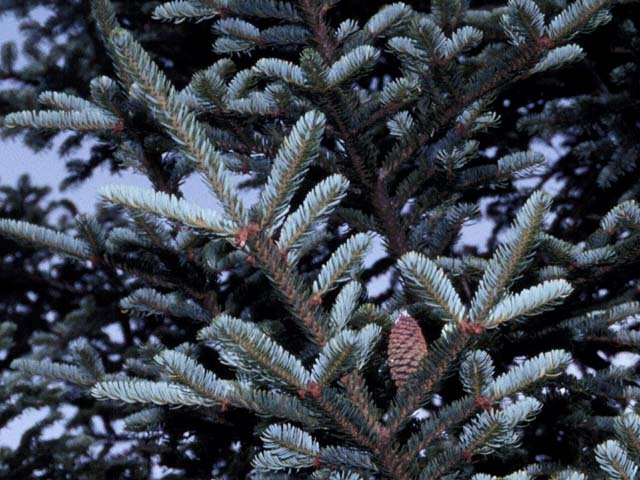 One thing first, as you can see from it's Latin name Abies fraseri, Fraser Fir is it's proper name. However, every local you meet will call the tree a Balsam. Even the botanist disagree with our Fir being given a different status from Abies balsamea (read the Taxonomic notes from this page.). So, true to my native WNC nature I always call the tree a Balsam. Heck, there is even a community west of Waynesville called Balsam, named for the giant stands of the tree that stood on the mountain tops before they where logged. The southern Balsam is the only Fir native to the southern Appalachians. 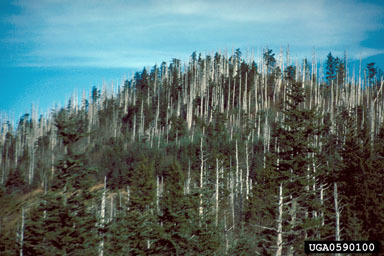 It is a remnant of the great Fir forest that covered these mountains during the last great Ice Age. 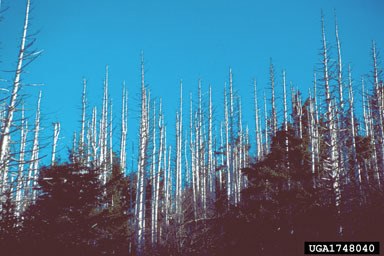 As the Glaciers, which never reached the southern Appalachians, retreated the Fir forest moved north with them to Canada, leaving "islands" of the Firs on the highest southern peaks where the climate is the same as Canada. But, alas, we may live to see the end. The native, mature Balsam has been all but wiped out by the Balsam woolly aphid (Adelges piceae) and acid rain. The Balsam woolly aphid is a nasty little sap-sucker, literally. It bites though the trunk bark until it can get to the tree sap. The chemical make-up of the saliva of the aphid causes the tree to create a chemical that hardens the area around the bite. As more and more aphids bite the tree the hardening effect eventually reaches the point where the tree can no longer draw water up through the trunk, and the tree dies from that point up. As time progresses the whole tree dies. 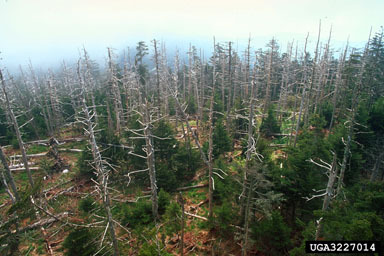 All the great stands of the Fir that once stretched along the Blue Ridge Parkway, died in the late 70s and early 80s. Their children are growing up underneath the still standing dead parents, but they too will succumb to the aphid. Some trees will survive however, North Carolina is the largest Fraser Fir Christmas tree producer in the country. These farms will use chemical pesticides to protect their farms. I'm very familiar with this industry since my Mom was born and raised in the Christmas Tree capital, Avery County. As many of you may know Balsams are my favorite tree. Partly because they are rare and grow only in the highest and most beautiful places we have. If you are out hiking and see a native Balsam you will most certainly be in one of the most beautiful places on Earth. Another reason I like the tree is because I want to save it. However, the Ranch ,at 4100 feet elevation, is at the extreme lower limit for growing the tree, but I am going to try. For those of you have come to the Ranch, you may not have realized that we have a small stand of Balsam planted by Dan and John, standing above the pond at the intersection of Juniper road and Beechwood road. While writing this article I did a search on http://www.google.com for "Adelges piceae", and found this site. 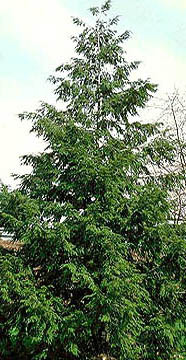 My second most favorite tree is the Hemlock, especially the rare Carolina Hemlock. Their limbs come out of the trunk hang downwards somewhat and droop at the end. 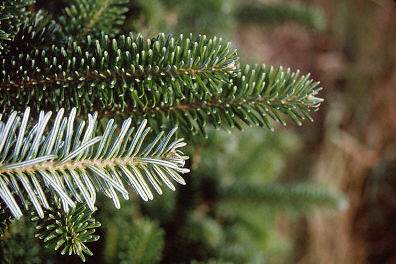 And unlike most pines, the Hemlocks needles are soft and subtle. The over all effect is that the Eastern and Carolina Hemlock are grand and graceful trees. 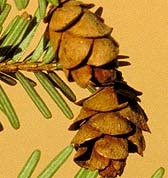 The Eastern Hemlock is the most shade tolerant of the eastern pines. It's found mostly on north facing slopes, older forests, and rocky stream valleys, It grows slowly, but can grow up through almost any forest type when healthy. 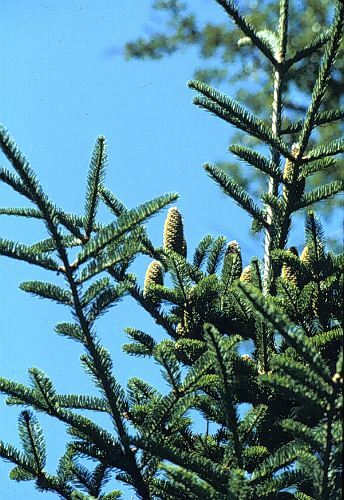 Hemlocks often grow in pure stands, and healthy hemlock stands are almost magical with their dark shade, their straight, tall trunks, and their clear forest floor, as very few plants can grow with so little light. 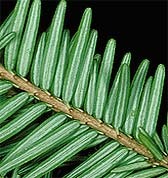 Hemlock needles are short, usually less than an inch long, and they grow in two rows on each side of the branch. The bark is a dark silver on young trees and branches, turning gray and eventually reddish with age. The cones are very small. However, it looks like the Hemlock too will suffer the fate of my other favorite trees. Death caused by us transporting other insects and diseases from around the world to here. The Balsam wooly aphid (Adelges piceae) that is exterminating the Fraser Fir has a sap-sucking Japanese cousin , of course named after the tree it kills, the Hemlock wooly aphid (Adelges tsugae) that is on its way here. 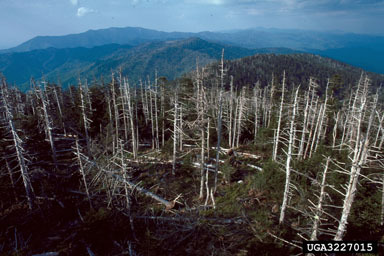 Last summer infected trees where spotted in the southern part of the Smoky Mountain National Park and in the Murphy and Andrews area. I found this link to a map showing the infected and newly infected counties in 2001. It looks like Haywood county is being surrounded. There are other links from this site that explain more. The USGS is working with the National Park Service to try and determine the factors that cause the spread of the aphid. After reading several of these articles, it appears that some stands of Hemlock manage to not be totally wiped out, but they are not sure of the reasons. It appears altitude plays the biggest role in this. Let's hope so! The Hemlock Wooly Adelgid Web Site has a lot of links that give a lot of information about what is going on with the battle. I found a really good page that describes the search for biological controls. This site will require you to have or install the Acrobat plug-in if you don't already have it. One of the reasons I built my house where I did was because of the surrounding Hemlocks. They give color, protection, and grace to the woods around the house year round. I would have to move if anything happened to my them. This place would be haunted by their memory. I have very mixed feelings about this tree, thought it's not the trees fault. In the spring, the sweet smell of the multitudes of Locust blooms is the smell of ambrosia, heaven on Earth. Because of the smell of Locust or Black and Yellow Locust are often referred to as Honey Locust, and indeed the bees do make honey from these blooms. However, the Honey Locust is actually the name of another species of tree, Gleditsia tricanthos. Because of its rot resistance, the Locust took over the role of the American chestnut for many things like fence posts and rails. They have a very, very dense wood which is very heavy, but makes excellent firewood. The wood will burn at a slow pace for a long time. So why might you ask you I not like this tree? I'm not sure how the tree got the name "Black" Locust, but in the winter, their dark, dark, rough bark looks black. And their twisted shapes, make the areas they grow look like one of the most depressing areas I know. Looking dead and haunted when there are no leaves on the trees. On top of this, they have very nasty thorns that always tend to whack you or scrape you when you go near one, especially the saplings. So I guess this is why I dislike them so. The Locust is a reforestation tree, or as I refer to them a "weed tree" or "scab tree". You may hear locals call an area "scab woods", referring to the fact that the forest is trying to heal itself. In fact many, many places aroun Haywood county and just about every where else have "scab" woods. I see "scab" woods alot along roads, as the locust and briars take back over the road banks. The saplings that I'm constantly have to fight back from my pastures will grow from nothing to 6-8 feet in one summer. So when you see a Locust you can be very certain that the area was pasture, not that long ago. After the the Locust establish a cover, the other trees move in and then crowd out the Locust. However, this tree may be one on its way to extinction here too. About 12 years ago I started noticing that all the leaves on the Locusts in Tennessee and the piedmont of North Carolina where turning brown about halfway through the summer. By late summer they where nothing but leaf skeletons. Over the years this plague has moved higher and higher up into the mountains. It finally covered Haywood county about 4 years ago. This plague is the Locust Leaf Miner(Odonatata dorsalis). The leaf miner is a beetle about 1/4 inches long that along each stage of it's development from larvae to adult eats different sections of the leaf. In the end nothing is left. Apparently, since the leaf destruction starts slowly, the trees are able to get some energy from their leaves because the tress don't immediately die. But it does weaken them and if any other pests invade, the tree probably won't survive. So far, the leaf miner has not made it all the way up to the Ranch. I suspect that our colder climate has kept the beetles at bay, but with the winters getting as warm as they are, it is probably only a matter of time.